Typically ranges from $50.00 to $60.00 & up per sq. ft. depending on the complexity of the log home design & delivery destination. Spruce to Douglas Fir adds $5.00 per sq.ft. and is more because it is premium framing lumber. *Both of these items will likely add another truck to the package. We have a great variety of proven engineered stock plans available. The floor plans on any of these plans can be modified to fit your individual needs and preferences. Our Team is also adept at Timber Frame or stick frame with log or timber accents. This package includes the log shell package and completely finished. This package ranges in cost from $150.00 per sq.ft. & up (which is owner built) and $250.00 per sq. ft. & up (General Contracting firm). Typically ranges from $40.00 to $50.00 per sq.ft. for the Timber Frame Wall Panel Package delivered and installed, $200.00 per sq.ft. is where they start for a Turn-Key construction. We put the Timber in the Timber Frame!! We also specialize in the Crafts-Man Hybrid Post and Beam and the Highlander Hybrid Series. This is the “Owner Built Package”. Includes all material and labor for the roof – system framing, the roofing material, doors and windows. This is the process that will make your log shell weather tight. It can range from $100.00 to $150.00 & up per sq. ft. and depending on the complexity of the design and can range widely, depending on the type of windows, doors, roofing, size of decks and materials used. “This is the most important part of the log home. It includes all major inspections and can be made very habitable. Come & See Our Work!!! Paradise Mountain Log Homes is family owned and operated! We deliver and install homes throughout the Northwest, so give us a call to see if there is one in your area for viewing. 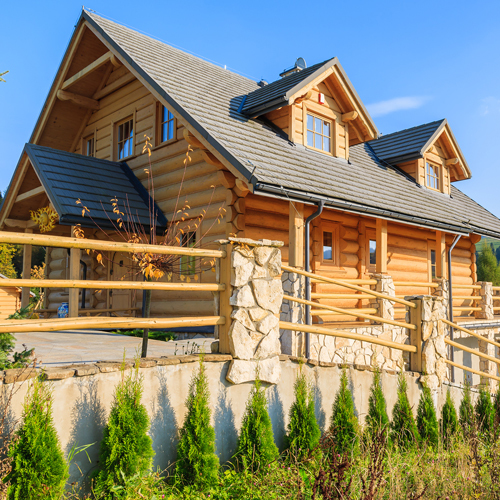 Our customers are very proud of their log homes and love to show them off. Paradise is a General Contractor also, and has 30 years of experience in the building industry, with over 25 years specializing in Log Homes & Timber Frame construction. Tom & his experienced building crew have valuable hands-on experience from setting the log packages to finishing the homes to a Turn-Key Package. Specializing in Quality and Service with providing the finest Handcrafted Log Masterpieces with the experience of over 1500 Handcrafted Log Homes behind us since 1978 and building a very distinctive Timber Frame that is very affordable. Contact us today to get started on building your dream home! Call us at 1-800-840-LOGS (5647) or contact us online today!